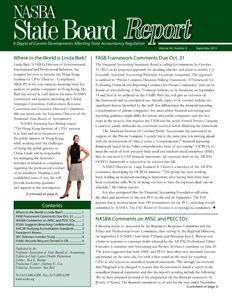 The Association to Advance Collegiate Schools of Business (AACSB) is engaged in an intensive review process of its standards for accreditation of institutions which it expects will conclude with the adoption of new standards and processes in April 2013, Dr. Jerry Trapnell writes in “Frontiers,” a blog of the Western Cooperative for Educational Telecommunications (WCET). The AACSB currently accredits 655 institutions in 44 countries, which is only 5 percent of the world’s institutions that are offering business degrees, Professor Trapnell notes. How distance learning should be addressed in these standards is being given considerable attention by the AACSB’s Distance/Online Education Task Force. It is unlikely that any new standards will be addressed to this mode of delivery, Dr. Trapnell states, but the broader standards on curricula content, faculty qualifications, infrastructure, etc., will be applied to all delivery modes. WCET was founded by the Western Interstate Commission for Higher Education in 1989 to integrate distance learning and education technology into the academic services of higher education institutions in 15 Western states. Its membership now includes representatives in nearly every state and several countries, the organization reports. The WCET is working on a “State Authorization Reciprocity Agreement” that is expected to be released later in 2012. This would make it easier for institutions to comply with the U.S. Department of Education’s requirement that will go into effect on July 1, 2014 calling for institutions offering distance or correspondence education to acquire authorization from any state in which they operate. This authorization is required to maintain eligibility for students of that state to receive federal financial aid. In June the Accrediting Commission for Community and Junior Colleges of the Western Association of Schools and Colleges took action against 45 institutions for failing in some way to meet its standards, but only the City College of San Francisco received an order to show cause for non compliance with its eligibility requirements. By June 2013 the City College of San Francisco must show cause why its accreditation should not be withdrawn and that the deficiencies noted have been corrected. The City College of San Francisco serves 100,000 students at nine campuses and many other sites throughout San Francisco.